Three things for our readers this Thanksgiving Day. First, it's somehow befitting of Thanksgiving's origins that the cornucopia on many tables of today consists of food that would be virtually unrecognizable 100 years ago, let alone 400. Turkeys nowadays will be over two times bigger (an average of 28 pounds) than their "ancestors" of the 1930s, thanks to genetic modification. And the turkeys of today freeze faster, too, thanks to the airplane de-icer they are sprayed or immersed in. And the turkey's tablemate, the potato, has also been susceptible to industrialization's easier-faster-more fix. Mashed potatoes are easier to prepare, thanks to the potato flake, the making of which involves a lye bath. Read more in Wired Magazine's article "Industrial Thanksgiving." 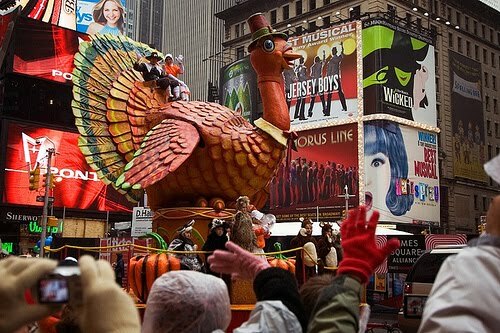 Lastly, let's not forget Thanksgiving's younger, sister holiday, Black Friday, and its modern-day incarnations: Chicago's McDonald's Thanksgiving Parade, Philadelphia's Ikea Thanksgiving Day Parade, Minneapolis' Target Holidazzle Parade, New York's Macy's Thanksgiving Day Parade... a veritable cornucopia of consumerism. Labels: consumerism, corporate issues, food, fun, politics, science, U.S.
Love the video. My Thanksgiving meal was sponsored by the new movie "The Road". It was a depressing meal.